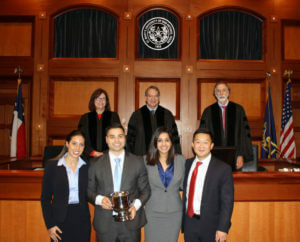 Loyola Law School, Los Angeles claimed the national title in the St. Mary’s University School of Law‘s annual Lone Star Classic mock trial competition with its final-round victory over the University of Maryland Francis King Carey School of Law on Oct. 15. Thomas Pacheco from the University of Maryland was named Best Speaker of the competition. The Classic, which was held Oct. 13-15, is an invitational mock trial competition for ABA-accredited law schools across the nation. St. Mary’s University in San Antonio, Texas, has hosted it for 16 years. This year’s mock trial problem was a case in the imaginary state of Lone Star. In the case, an older married couple was found murdered in their home, shot execution style. Evidence linked their nephew, the defendant, to a drug cartel and suggested that the victims were cutting him out of their will due to his drug cartel connections. The victims were cooperating with the police in the police investigation of the nephew. Professor of Law David Schlueter wrote the problem that was the basis of the trial. The 2016 competition featured 16 law schools: University of Alabama School of Law; University of California Hastings College of the Law; Campbell University School of Law; Charleston School of Law; Chicago-Kent College of Law; Elisabeth Haub School of Law at Pace University; Faulkner University School of Law; University of Florida Levin College of Law; Georgia State University College of Law; South Texas College of Law; Loyola Law School, Los Angeles; University of Maryland Francis King Carey School of Law; University of North Carolina School of Law; University of South Carolina School of Law; Stetson College of Law; and Texas A&M University School of Law. As the host, St. Mary’s Law does not compete in the Classic. Three preliminary rounds were held at the Bexar County Courthouse and the Bexar County Justice Center. Four teams – Loyola, Maryland, South Carolina and Chicago-Kent – advanced to the semifinals in the Law Classrooms Building on the St. Mary’s campus. The final round was held in the law school’s high-tech courtroom. The Hon. Xavier Rodriguez, United States District Judge for the Western District of Texas; Richard Durbin, U.S. Attorney for the Western District of Texas; and Donna Coltharp, Deputy Federal Public Defender for the Western District of Texas, judged the final round. The Lone Star Classic Committee was composed of Lampley; Assistant Directors Austin Griffith, who is Chair of St. Mary’s School of Law’s Board of Advocates, and Margaret Rodgers; and committee members Tiffany Lee and Brian Smith.